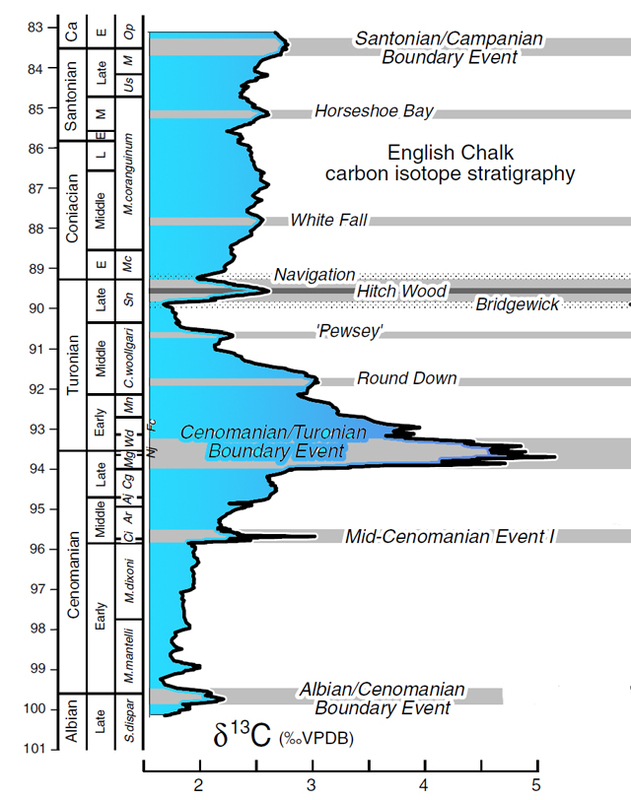 The carbon contains naturally two stable isotopes:12C (approximately 98,89 %) and13C (approximately 1,11 %). We express the relative proportion of13C and of12C by an agreed value d13C (it for one thousand). Variations of d13C are registered on total samples of chalk. The profiles of d13C on English chalks, compared with those of series carbonated of Italy (Gubbio) or Spain (Santa Ines) show strong analogies. A reference curve (Jarvis And al2006) Was proposed for transcontinental correlations. Variations in the primary productivity and the influential burying of the organic matter on him d13C. Plants use both types of carbon during the photosynthesis, but 13C, a little heavier, is a little less absorbed than 12C. An increase of the primary productivity pulls an increase of d13C because12C is held in plants and grounds. "Light events" (nnegative excursion, d13C weak). The limits of floors are generally defined by renewals of sorts of bodies and it is not surprising that he corresponds to it excursions of d13C. The positive excursions of d13C are sometimes bound to the OAEs (Oceanic Anoxic Events), diminution in oxygen dissolved some deep waters and increase of the oceanic productivity and sometimes in the marine biological extinctions.